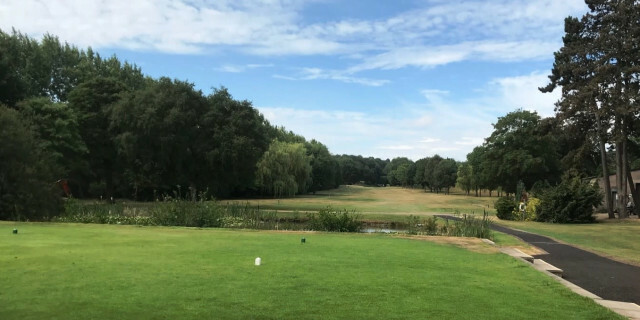 I recently visited Erewash Valley Golf Course in Derbyshire. If you have travelled the M1 past junction 25 this is the golf course you will see before reaching the Long Eaton turn off. The original course was cut in half by the construction of the motorway. I have played here before and it is a great members club with a strong reputation for a quality, well presented course with a friendly approach to the visiting golfer. I have taken golf societies to this venue before and never been disappointed. I had noticed that the first hole was called Memorial. It’s a very strong 557 yard par 5 opener requiring the first tee shot over water and then approaches into a well protected green. I popped into the excellent clubhouse and had the chance to chat to the club chairman Paul Thomas. I had never properly appreciated a beautiful wooden fireplace and surrounds that is situated in between the trophy cabinets. On closer inspection I saw that brass plaques had been inscribed with the names of club members who had made the ultimate sacrifice in WW1. The club was formed in 1905 and was still relatively new at the beginning of the war. Many members of the club volunteered for military service and a Roll of Honour of those joining up was maintained at the club. We began to chat about the club's history and it was clear that the club's records provided an excellent social history archive. Whenever news of a fatality involving a member was received an entry was made into the records as a mark of respect. Many of those listed were important personalities within the club. Mr E C Baker was the club secretary prior to his military service. He was a 7 handicap player who led out the first team against other clubs. Lt PG Pyatt was described in the minutes book as “a most popular and esteemed member of the club”. The memorial features 11 names for WW1 and two for WW2. The memorial was donated by the club president Charles Robert Crompton. He was a magnificent benefactor and had previously been Works Manager at Stanton Ironworks. When the ground was sold off he bought 102 acres to protect the golf course and gave it to the club. In addition to the memorial, the club planted 11 trees in between the original second and third fairways as a living memoriam to the fallen. CC Baker, EC Baker, N A Chambers, R I Doncaster, W K Haslam, FLH Jackson, S B Melville, G H Morgan, R G Pyatt, G C Shaw, W Taylor. Paul disclosed to me that his current house was owned by a direct descendant of R I Doncaster and it is clear that there are still a lot of local connections to those detailed within the plaques. I explained about the Everyone Remembered scheme being coordinated by the Royal British Legion and he is looking to formally recognise those who fell by visiting the website and ensuring that those members listed are remembered. The club are also going to run a one off event on Sunday 11th November 2018 and copy the approach used at Carnoustie Golf Club when the names of the fallen are read out formally and acknowledged and remembered for the sacrifice they made for the generations to follow. 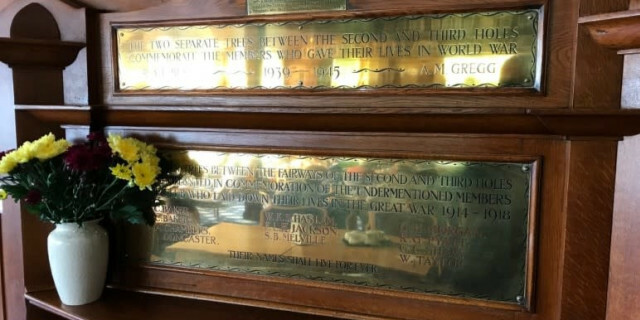 I will ensure that details of this memorial are passed onto those who maintain the war memorial archive within the Imperial War Museum as this does not appear within their current records. If you have a similar memorial at your club please contact me via Golfshake and let me know what you plan to do to acknowledge those past members who served and sacrificed on our behalf. I am convinced that there will be many similar memorials at clubs around the UK who will have an interesting story to tell.